Work is underway to build the world’s tallest residential tower. 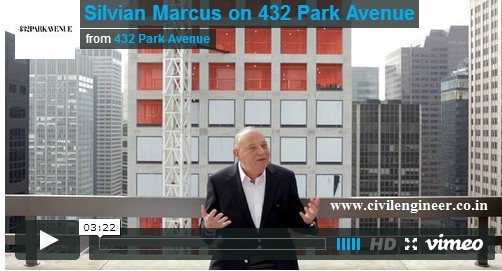 In a video, Engineer Silvian Marcus, CEO of WSP Cantor Seinuk, explains how 432 Park Avenue in New York City is “one of the most fabulous, interesting and unique structures ever built” because of its design created by Rafael Viñoly. The tall but slender building, which will eventually reach 1,396-feet tall, “has a 30′ x 30′ core bounded by thick concrete walls” and a “beamed-and-columned facade” that keeps it stable. The tower is slated for completion by 2015. The tallest residential building in the world-to-be is on the rise, and structural engineer Silvian Marcus explains, via this video on World Architecture News, how a 1,400-foot building stays upright. Donning a suit and a hard hat, using adorably accented English, he explains that the challenge of 432 Park—”one of the most fabulous interesting and unique structures ever built”—is that it’s both tall and slender. The center of the building has a 30′ x 30′ core bounded by thick concrete walls (“like the backbone of a body”), and that plus the beamed-and-columned facade is what keeps the thing stable. That pair of measures means that the apartments don’t need any structural support or dividers, leaving buyers able to have a completely open floorplan if they choose. (“He wants a loft!”) The video also offers close-up, insider-y construction shots of the very square tower and some time-lapses of the building’s ascent.